Ashington Shotokan Karate Club was established in 1974. The senior club instructors are Sensei Jill F Kelly (6th Dan) and Sensei Trish Bruce (6th Dan). The club is affiliated to the KUGB (Karate Union of Great Britain), the largest single-style karate organisation in the United Kingdom. Sensei Jill began teaching her own classes at Ashington Karate Club in 1988. Starting in 2016, the club began training at the new Ashington Leisure Centre which had opened on Lintonville Terrace. The club currently trains on Saturday mornings at the new Ashington Leisure Centre from 10:00 am-11:30 am and Thursday evenings at Josephine Butler Campus, Northumberland Church of England Academy from 6:00 pm-7:00 pm (junior grades) and 7:00 pm-8:30 pm (senior grades). The club caters to students of all ages, with a minimum starting age of five years old. On many occasions, we have parents join their children to train together. Currently we have over 10 sets of parents and children training together. One such parent who started training with her children is Sensei Trish, who specialises in taking the junior grades! The club is supported by a committee made up of volunteers who are either club members or their relatives. The committee work all year to fund raise in order to pay competition entries, purchase equipment, organise social trips and parties, and many other activities. These events allow club members to get to know each other, and gives the club a ‘family’ atmosphere, which is something difficult to achieve in a large club. While competition is not a necessity for our members, many of our students have enjoyed entering competitions and experienced success at local, regional, national and international level! Currently, we have four members on the KUGB England Squad. Several of our senior members are also qualified as KUGB instructors, and we have several students taking part in the KUGB Young Leaders scheme, which develops students aged 12-17. Our instructors and senior members also regularly attend courses around the country with senior KUGB instructors, which keeps their knowledge up-to-date and allows them to experience a range of different teaching styles. We welcome new members of all ages and abilities to the club. If you have any further queries, please contact us through our website or social media pages. Family deal - for every two family members who pay for the class, one trains free. 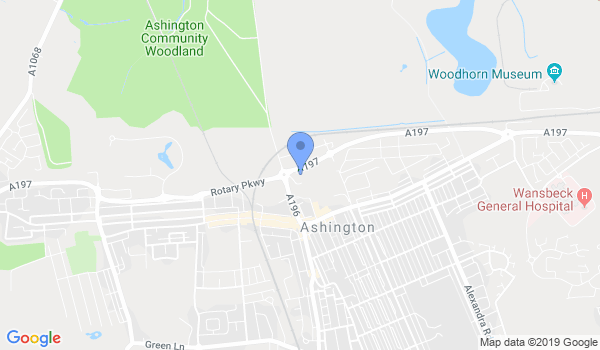 Would you like more information on hours, classes and programs available at Ashington Karate Club? Please contact the school with your questions. Update the details, Write a Review or Report Error of Ashington Karate Club. This Chart shows the Martial Arts Styles offered most in Ashington, UK area. View a list of Dojo in Ashington, or enter your address below to find schools closest to you.